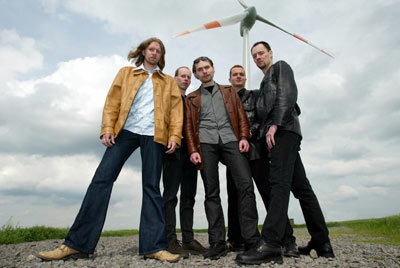 Germany's Poverty's No Crime made their album debut in 1995, though the band formed four years earlier. Then signed to the Noise Records label, Poverty's No Crime released their debut, Symbiosis, to good reception. They followed this up with 1996's The Autumn Years, which reached a wider international audience - Japan's Burrn magazine gave the album 88/100, and it was voted in to the Germany's Top 20 of the year album charts. Though surprisingly dropped from their label shortly thereafter, the band forged on and released Slave To The Mind in 1999, their first for their present label, InsideOut. After some personnel changes -- the bassist and keyboardist exited -- the band released 2001's One In A Million, another highly regarded release. Now, in 2003, Poverty's No Crime are supporting their newest release The Chemical Chaos, having played a few dates in Germany this past November, with one date to come in December. 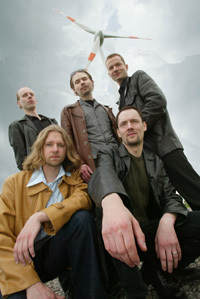 The current line up is Jörg Springub on keyboards, Heiko Spaarmann on bass, Andreas "Theo" Tegeler on drums, Volker Walsemann on vocals and guitars, and Marco Ahrens on guitar. Davide Guidone spoke with Marco about the new album. Davide Guidone: Hi Marco, let's talk about The Chemical Chaos. What are your thoughts about it? Marco Ahrens: I think it's a very good album again, it's less heavy than One In A Million, and it has a rock side that the previous one hasn't, also thanks to a different guitar sound. It's still progressive metal, but you can find out a lot of rockier aspects on it. DG: So what are the main differences between this new album and the others? MA: While we were writing songs for One In A Million, our bass player left the band so I think you can hear [it] in the songwriting, because we didn't know how it was going on with the band, and it is very evident. You can notice it. DG: I think that the bass guitar has an important place in your music. MA: Yes, it wasn't easy to find a good bass player as good as the old bass player. So we tried many ones, and we found Heiko, thanks to our studio man who said: "I know a bass player who is as good as you want " and he called him. So we met one day in the rehearsal room and we all thought: "he's the man." DG: And what about the lyrics? Is it a sort of concept? MA: It's not a strictly a concept like Operation Mindcrime, it's a topic album; there's a main topic, which leads the album, like in every Poverty's No Crime album. DG: What are the main influences in your music? What's your opinion? MA: We listen to different music, e.g. I really like King's X, but also old Dream Theater stuff, - I don't really much like the new ones. DG: Is there a Rush influence, too? MA: Yes, everyone in the band likes Rush, Fates Warning, Iron Maiden, but the drummer and the bass player likes death metal, or the new keyboard player likes progressive rock killers like Magma or some bands that I've never heard about. DG: Why did you choose this moniker for the band? It's very strange?What does it mean? MA: When we started as band, we were searching for a new name, and Volker had a phrase book where there were English idioms and phrases. So he brought it in [to] the rehearsal room and he said: "There is this, this, and Poverty's No Crime." So everyone said:" Poverty's No Crime sound pretty good." It isn't a really political name, but it's a statement. It's a name that can last thirty years for a band. Because there are some names when you are fifteen or twenty, sounds very cool, but when you become older you won't like, as Death Angel did, when they called themselves DA in the end. While Poverty's No Crime is a timeless name. DG: Can you explain why Noise Records didn't renew your contract some years ago? MA: I think one point is that we didn't sell enough records, and we never really fit in the concept of the Noise Records [style]. When we started, they were searching for new melodic metal bands, and the man who ran the label thought we could have been a big sign because of Dream Theater. Actually, they didn't really know how to promote our music. They had a different target from our stuff. So he said "Sorry boys" and that's it. DG: What do you think of your present label, Inside Out? MA: It's the best label for our kind of music. People from Inside Out really love and like this music, and have sense, too. They really do a great job, with wonderful covers and [a] slipcase. You always get something from your money. Every band is happy at Inside Out. If you are a fan, just listen to it and maybe you like it. DG: Have you planned a tour to promote the album? MA: Not really yet, we did some gigs in Germany, but we haven't planned a tour, yet. If something comes, we'll be very happy. It's difficult to make it because we don't have a promoter. DG: Why don't you have a promoter? MA: Hmm, good question, because we know when we have time and we can do it, and it's hard to do a European tour and find someone else to pay for it. DG: Will you come to Italy , too? MA: We hope so, but I can't promise. When a new release comes out, people write down their comments on the guestbook. Most of them are from Germany, but there are a lot of Italians, too. DG: And outside Europe, how is the situation? Do you have a lot of fans in the USA or in South America? MA: There's a lot of people who write in the guestbook: "Please would you come to Brazil?" Yes, we'd like to come to Brazil, but it's difficult. This new record is the first one that will be published in America, so they won't have to import it. So the things will get better. And to reissue the past releases, it will depend on the success of The Chemical Chaos. DG: Ok, we've finished. Do you anything else to say? MA: I hope that all the Italian fans would like the records, maybe someone remembers when we did a little tour with Virgin Steele and Angra, maybe seven years ago. It's too much time?